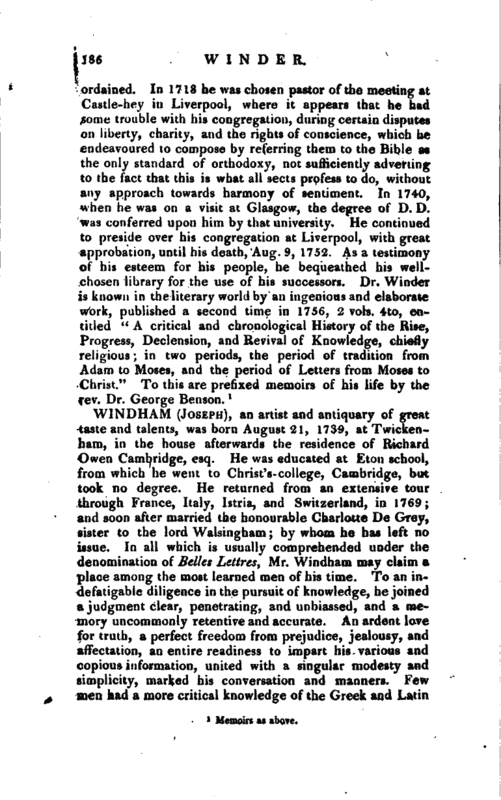 , an artist and antiquary of great taste and talents, was born August 21, 1739, at Twickenham, in the house afterwards the residence of Richard Owen Cambridge, esq. He was educated at Eton school, from which he went to Christ’s-college, Cambridge, but took no degree. He returned from an extensive tour through France, Italy, Istria, and Switzerland, in 1769; and soon after married the honourable Charlotte De Grey, sister to the lord Walsingham; by whom he has left no issue. 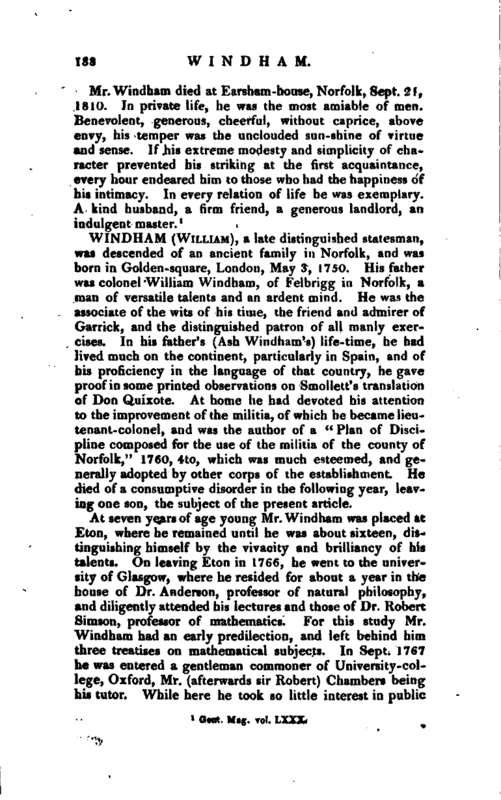 In all which is usually comprehended under the denomination of Belles Lettres, Mr. Windham may claim a place among the most learned men of his time. To an indefatigable diligence in the pursuit of knowledge, he joined a judgment clear, penetrating, and unbiassed, and a memory uncommonly retentive and accurate. An ardent love for truth, a perfect freedom from prejudice, jealousy, and affectation, an entire readiness to impart his various and copious information, united with a singular modesty and simplicity, marked his conversation and manners. Few men had a more critical knowledge of the Greek and Latin | languages, or a deeper feeling for the beauties of style and sentiment in the classic writers; but in his minute and comprehensive acquaintance with every thing in them illustrative of human life and manners, especially all that relates to the fine arts, he scarcely had an equal. The history of art in the middle ages, and every circumstance relative to the revival of literature and the arts, from the fourteenth century to the present time, were equally familiar to him; and his acquaintance with the language of modern Italy was surpassed by few. He had very particularly studied the antiquities of his own country, and was eminently skilled in the history of English architecture. His pencil, as a draftsman from nature, was exquisite. His portraits of mere natural scenery were peculiarly spirited and free, and his drawings of architecture and antiquities most faithful and elegant. During his residence at Rome, he studied and measured the remains of ancient architecture there, particularly the baths, with a precision which would have done honour to the most able professional architect. His numerous plans and sections of them he gave to Mr. Cameron, and they are engraved in his great work on the Roman baths. To this work he also furnished a very considerable and valuable part of the letter-press. He also drew up the greater portion of the letter-press of the second volume of the “Ionian Antiquities,” published by the society of Dilettanti; and Mr. Stuart received material assistance from him in the second volume of his Athens. In his own name he published very little*. His accuracy of mind rendered it difficult to him to please himself; and, careless of the fame of an author, he was better content that his friends should profit by his labours, than that the public should know the superiority of his own acquirements. 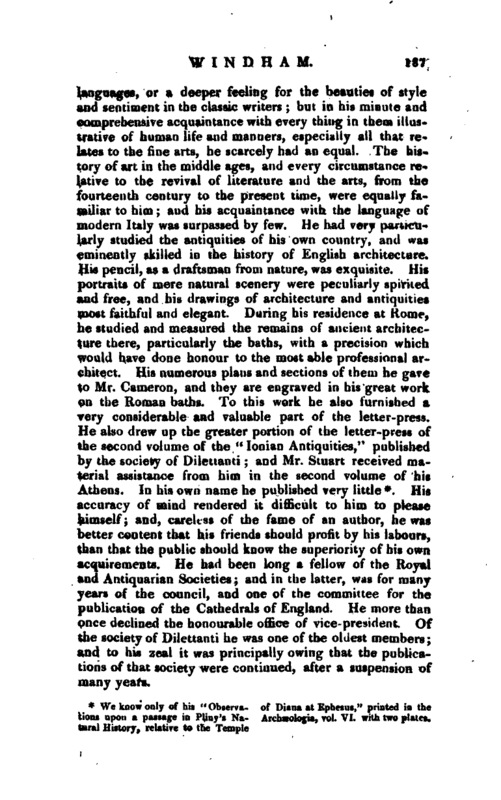 He had been long a fellow of the Royal and Antiquarian Societies; and in the latter, was for many years of the council, and one of the committee for the publication of the Cathedrals of England. He more than once declined the honourable office of vice-president. Of the society of Dilettanti he was one of the oldest members; and to his zeal it was principally owing that the publications of that society were continued, after a suspension of many years. 1 Gent. Mag. vol. LXXX.